Provides 100% clean surface for restoration – Eliminates risks associated with residual contamination. Reduces risk of recontamination from other sources, such as upland seep zones, CSO discharges and spills. Dredging and excavation often can achieve cleanup levels for the site with the least uncertainty regarding future environmental exposure to contaminants. This is because the contaminants are removed from the aquatic ecosystem and disposed in a controlled environment. Removing contaminated sediment rather than managing it in place can also provide more flexibility regarding future use of the water body. Although it has been documented that, even after dredging, bioaccumulative contaminants often result in fish consumption advisories for a long period of time after sediment removal and other types of institutional controls might also be required. The primary negative associated with sediment removal is that it is typically far more complex and costly than other alternatives. It is understood that dredging will result in some level of uncertainty associated with estimating re-suspension and residual levels of contaminants post-dredging. Dredging also creates the need for transport, storage, treatment (where applicable), and disposal facilities. This may lead to increased impacts on communities. In some parts of the country, disposal capacity may be limited in existing municipal or hazardous waste landfills, and it may be difficult to site new local disposal facilities. For these reasons, sustainability and the impact of dredging, particularly where sediment must be transported long distances to a disposal facility, is considered far more negative than other remedies. A dredge & cap approach is believed to address many of the above limitations, while reducing risk of remedy and costs. 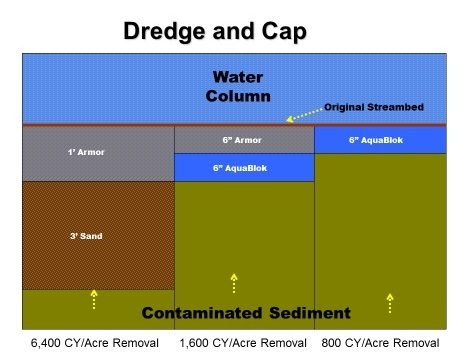 What Is Dredge & Cap? The essential concept behind this approach is that dredging activity should be focused on only the highest levels of contaminant concentrations within a site, and removal should not be driven by achieving a low target residual concentration level. Any remaining contaminants in the underlying sediment can be sequestered or isolated with either a low-permeability cap (AquaBlok®) or a permeable in-situ amendment layer (AquaGate®+). The graphic to the right illustrates the concept and shows the reduction in removal volume that can be achieved assuming different assumptions regarding cap type and cap thickness. AquaBlok materials have been used on many occasions to implement this remedial approach. One example is shown in the image to the right, where an excavation in the dry was performed in the Genesee River (Wellsville, NY) at a historic refinery site. Because it was known that soil and sediment impacts extended a significant distance, it was determined that removal of only the top three feet of sediment would be performed and a low-permeability isolation barrier (AquaBlok) would be used to sequester any residual contamination to minimize the potential of impacts to the restored stream bed.